Only four more days until Halloweenie and a few more hours until voting ends for my giveaway! If you haven't voted, please do so. I planned on doing something exciting with Ick-a-Body as a base but time was not on my side last week so here it is with just a base coat, two coats (I probably should have done three) and a top coat of China Glaze Fast Forward. I do like the polish, it's a clear black base with a booty-load of orange glitter. I kept it on for four days and when I realized I wasn't going to do much more with this mani I took it off. No bueno! I soaked each nail in acetone for at least a minute each and still had to scrub. It's pretty, but not pretty to remove. 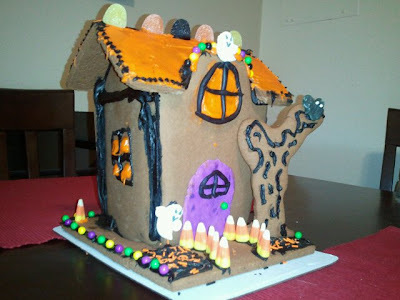 Also to get more in the mood I bought a haunted gingerbread house, it was a bit messy and black icing was everywhere but I think the end result is extra cute! What are you doing to get in the Halloween spirit? Thats too bad Ick-A-Body was difficult to get off :( It was easy for me to get off....it started chipping within a day on my fingers. But I didn't use a topcoat. Not sure if that would have helped. Thats an awesome gingerbread house! I never have much trouble removing glitter, even when I cake on 3 or 4 layers.. though I do soak them in acetone and use heavy-duty felt to take it off, which is great.